This Simpli Home TV stand is sure to fit right in regardless of your floor space. Easily accommodate 51-inch to 60-inch televisions with the brown free standing TV stand. Has the ability to hold gaming consoles, movies, and even speakers. Cord management cutouts for easy installation of TV and media components. A little bit modern, a little bit eclectic, this versatile TV stand is designed to stand out. Available in dark taupe, its unique cuts bring eye-catching appeal, while the angular, decorative black panels add even greater interest. Two drawers and three open-faced cabinets provide much needed storage space, perfect for your favourite DVDs and other much-needed utilities. Get it home to flaunt your 48 LED television and enjoy movie nights in style. Holds televisions up to 48. The clean and elegant curved lines of this stylish TV stand allow it to fit seamlessly into any contemporary living space. The rich, dark cherry color complements a wide range of interiors, while the chic splayed leg design provides added style and stability. With the ability to accommodate most flat panel TVs of up to 60 inches, this TV stand is as durable as it is attractive. Three open shelves ensure unobstructed access to your audio/video components, while three roomy drawers allow you to store remotes, DVDs, and other accessories neatly out of sight. Function meets flair in this stylish TV stand designed to accommodate flat panel TVs up to 48 inches. Offering contemporary style, the neutral colour stand features clean lines and wood grain detailing for a distinctive look complete with modern bar pulls. It provides ample open and closed storage space for media components and accessories, keeping clutter tidied and out of the way. Versatile in design, the stand has an expandable side so you can adjust it to best fit your entertainment space. Top this sleek piece of with a flat screen TV and sit back and enjoy your favourite movies, sports and TV shows with close friends and family. Cosmopolitan 48-inch x 21-inch x 17.5-inch TV Stand in Brown This Simpli Home TV stand is sure to fit right in regardless of your floor space. 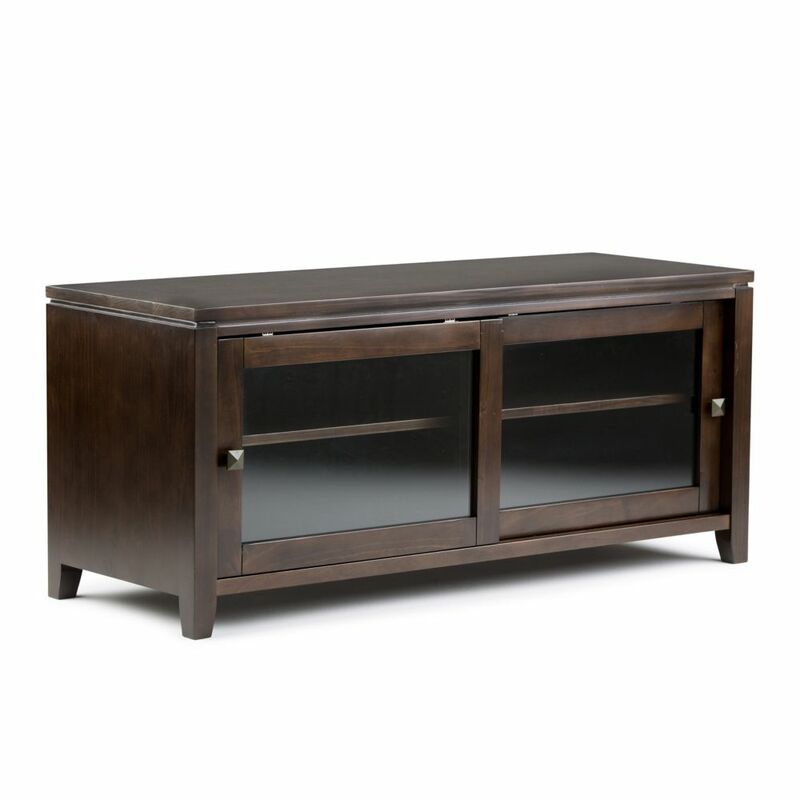 Easily accommodate 51-inch to 60-inch televisions with the brown free standing TV stand. Has the ability to hold gaming consoles, movies, and even speakers. Cosmopolitan 48-inch x 21-inch x 17.5-inch TV Stand in Brown is rated 5.0 out of 5 by 4. Rated 5 out of 5 by Ginger from Excellent value for the money. The tv console is... Excellent value for the money. The tv console is of good quality and is quite stable. Putting it together took some time, but that was expected. Use two people and take your time and it should go fine. Rated 5 out of 5 by watbuy from Best purchase I did Beautiful tv stand,exactly like in the picture. Very well made, easy to put together. Functional at the same time great looking.Packaging was good and delivered without damage. Homedepot has the good price overall, just buy it here and take a price match. Rated 5 out of 5 by Thunderman from Excellent purchase Assembly was very easy . Instructions are customer friendly and very well laid out. The unit adds elegance to my living room . I am wondering if this unit has a divider in the middle of the inside... And an adjustable shelf on each side ?